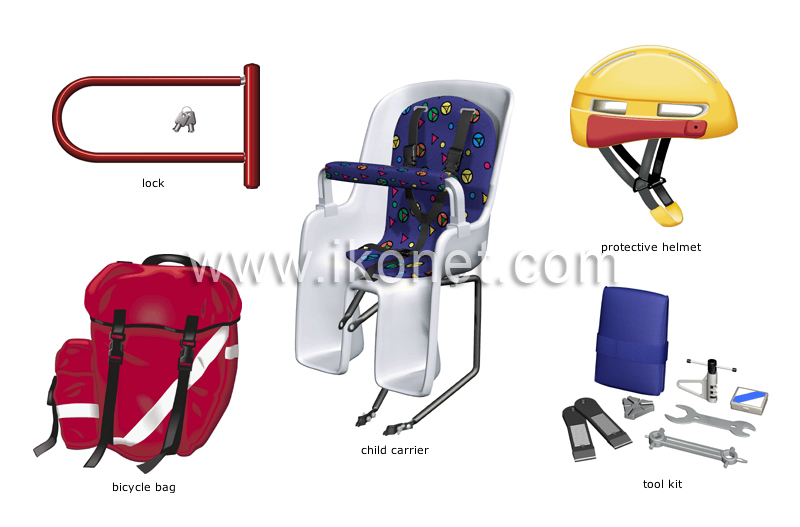 Seat attached to the frame or the carrier, comprising a harness and footrests, for transporting a child. Set of tools for simple repairs and adjustments, such as fixing a flat tire, replacing spokes or adjusting brakes. Bag that can be attached to the handlebars or the carrier. Rigid headgear covering the head to protect it in the event of accident. Antitheft system made up of two metal shanks, one inserted into the other and fitted with a lock, for locking the bicycle to a fixed object.